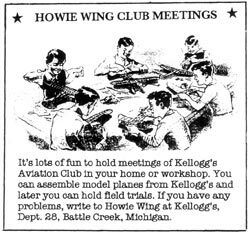 In part 2 of the Howie Wing Transcriptions series, we read how Kathy used the Internet to identify “Howie Wing” as a juvenile serial about young aviators. This Internet research lead her to Jack French and Karl Schadow, who filled in quite a bit more detail about the show from their own files. Their information indicated that there were actually two different seasons of the show and that the ad agency producing the first series was different from the second. This change of ad agency moved Karl from his initial research at the Library of Congress down to the J. Walter Thompson archives housed at Duke University. It was during his research at the Library of Congress, however, that Karl made an unexpected discovery that was to broaden our search for information outside the boarders of the United States. Most OTR references say that Howie Wing was on the radio from October 1938 through June 1939, but Karl, even before his fruitful visit to the Library of Congress (LoC), found a February 14, 1938 Los Angeles Times ad which announced Howie Wing as a new family show. So, very early on we verified that the show had been around at least 8 months longer than previously thought, which meant there were at least two seasons. Once Karl got to the LoC, he found a veritable treasure trove. One of the most exciting finds was another transcription of the show, and as a bonus, this show was the very last one made. It was broadcast in the US right around June 29, 1939. As exciting as that was, he also found, by listening to this final recording, that a third season of Howie Wing was planned when, at the end of the show, the announcer invited the young listeners to join Howie for further adventures the following season. However, no further evidence of a third run was anywhere in sight, so here was a mystery, which we would solve a little later. By the time we put together Karl’s notes from the LoC, we also learned that the show was probably also aired in Canada. Karl and Jack both found clues that there were a number of ‘premiums’ put out by Kellogg’s, the show’s sponsor, by way of promotion, and a number of those seemed to be made in Canada. There was also a somewhat obscure reference to a possible Australian run of the show. You will recall from Part 2 of this series that when I first began to look for help identifying what the transcriptions were, I’d talked to another OTR fan named George Hughes. At that time, George suggested someone who could play the transcriptions, if I was willing to put them in the mail. I wasn’t, but it turns out, the fellow George tried to refer me to was Ian Grieve, of Australia. As soon as Karl mentioned a possible Australian connection for Howie Wing, I thought of Ian, who is also a member of some of my Yahoo OTR groups. I knew from the groups that Ian is an avid collector/researcher of Australian OTR and he has provided many wonderful recordings to the community through his own efforts at locating, restoring and sharing the shows he finds. If anyone would know about a possible Australian version of Howie Wing, surely Ian would be that guy. Ian was a better contact than I hoped. He belongs to a dedicated network of like-minded preservationists in Australia, and he immediately put out feelers. Within a few hours he confirmed that Howie Wing had come to Australia and it was the American shows that were broadcast there. Later the Australians started supporting their own radio industry (and would have made their own versions using the American scripts), but Howie Wing came in a couple of years before that time. From Ian’s information we learned that the series ran, in Australia a little after it appeared in the US. At this point we do not yet know if the Australians had both seasons, or just the second season. Coincidentally, at just about this time, I noticed, on a popular auction site, that a 1939 Howie Wing Kellogg’s cereal premium had been up for auction by an Australian seller and had been purchased by an Australian bidder. I mentioned this to Ian, and, by luck, I’d saved the auction information. With that information, Ian was able to track down the buyer to Sydney. The buyer, Tony Austin, is an ardent collector of cereal premiums. He not only collects, but takes time to research the items in his collection. Tony became quite a fount of information about the show. Because of his collecting, he was aware that Howie Wing had also been very popular in Canada. This pointed us back to an earlier lead from Karl’s LoC visit that I hadn’t followed up on, but now, in our quest for more information, we looked toward Canada. Ian recommended an acquaintance, Archie Hunter, a Canadian OTR fan and researcher who I also knew about from our yahoo OTR groups. I contacted Archie and Archie was ready, willing and able to assist. He contacted some local radio stations and visited his National Archives. He was not only able to confirm that the show was heard and popular in Canada at about the same time it was broadcast in the US, but he also found some Kellogg’s premiums that were made in Canada. Then, at the Canadian National Archives, he found one more episode of the show! So now, we knew about 8 surviving copies. Things were moving pretty quickly. Ian says that this is a ‘lucky’ series. It certainly seems like the spirit of Howie Wing is guiding us on this journey. I found the transcriptions in the middle of February. By the end of that month I’d found Jack and Jack had brought in Jerry Haendiges and Karl Schadow. By early March we had quite a bit of solid information and had located another copy of the show at the Library of Congress, plus, Karl had learned about the Duke University Archive of the J. Walter Thompson Company, and Duke claimed they actually had scripts for the show on microfilm. By early April, Ian was firmly on board, and Archie had joined us. We’d also found Tony, the premium collector, who offered us a lot of detailed information about the advertising campaign. 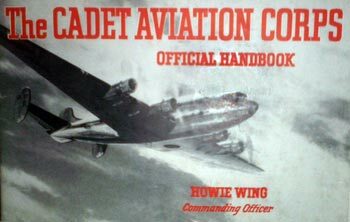 Tony has an amazing variety of premiums, including handbooks and other items from something called the Howie Wing Club. He also has full page ads for the show, and articles from the Australian radio guide, Wireless Weekly. The articles in Wireless Weekly were (purportedly) written for the youngsters by the “Commanding Officer” of the Howie Wing Club in Australia, WW I ace, Lt. Robert MacKenzie. Lt. MacKenzie, I believe, was part of the squadron that brought down the historic German ace known as “the Red Baron”. The articles Mackenzie wrote, for the Wireless Weekly consisted of a series of flying lessons. These flying lessons outlined how an airplane worked. Also through Tony we found out that the US had a similar role model for the American version of the club. In the US, Captain James H. “Jack” Knight, who had been a military flight instructor during WW I and a rather famous airmail pilot after the war, was the designated “Chief Pilot” for all the young American “cadets”. While we’ve had some trouble finding much information on Lt. Robert MacKenzie, the Internet is full of tributes to Jack Knight. His main, and much deserved, claim to fame is his daring flight across the American plains during a blizzard to ensure that the mail was delivered in the first-ever overnight flight coast to coast. Due to his epic flight, in an open cockpit biplane, airmail delivery was proved viable, and the US government agreed to continue subsidizing the fledgling industry until it could finally grow to be self-supporting. There’s even a 1950s children’s book, Pilot Jack Knight, which gives an account of this courageous man’s life. While information seemed to be pouring in from all sides, we still had many questions. One of the most burning for me was: Why wasn’t there a third season when the show appeared, to all intents and purposes, to be flying high in three countries on two continents? We also hadn’t clearly established which series had come first, the NW Ayer and Son or the J. Walter Thompson, plus, we had some references that indicated the show was on 4 days per week and others that indicated it was heard 5 days per week. We had theories, but not solid answers. Help, however, was on the way. For one thing, several of us found contemporary radio schedules that verified the times of broadcast for both the first and second run. We then learned that the first series was on 4 days per week (Monday - Thursday), and the second series was on for 5 (Monday-Friday). Still questing for answers, Karl headed down to the J. Walter Thompson Archives at Duke University in May, and we all held our breath. Did they really have scripts like they claimed? Might there be other recordings in this collection? I’ll give you the ‘bad’ news first. As far as Karl could ascertain, there were no other recordings in this collection… but, as bad news went, that was nearly trampled into insignificance when Karl verified that Duke did have scripts on microfilm. Not only did they have scripts, they had lots of them. Out of about 395 total shows broadcast, Karl found 195 scripts from the second series (all of them!) and even 10 from the first series that had been recorded by NW Ayer and Son. This helped us to verify that the transcriptions I found were from the first series and that the one Karl located in the LoC was indeed the last show broadcast in the US. It was also about this time that I found, via the NY Times online newspaper archive the reason why there had been no third season. Howie Wing was the work of one writer, Willfred (Bill) G. Moore. Captain Bill Moore had been a WW I ace, much like MacKenzie and Knight. Howie Wing was based, in part, on his experiences as a young pilot during wartime. Those of you who are fans of The Air Adventures of Jimmie Allen and Captain Midnight might recognize the name. Moore, along with sometimes writing partner, Robert W. Burtt, created and authored those shows. It appears, however, that Moore soloed for Howie Wing. The article on Bill Moore that I found in the New York Times Archive was, sadly, an obituary. In July 1939, right after the second season of the wildly popular Howie Wing show had wrapped, Bill Moore dropped dead suddenly from a heart attack. He was only 43 years old and left a wife and four children. Just days before his sudden demise, he’d been out scouting locations for the third season. We aren’t sure at this point why, when the show was so popular, the company decided not to continue it with another writer. From information we gleaned from a 1961 Writer’s Digest article by Moore’s writing partner, Burtt, we know that the authors did not own the copyrights on any of these shows, so the copyright holder (often the broadcasting company, and sometimes the ad agency) could have continued with a different writer had they chosen to do so. Perhaps we’ll eventually find the answer to this mystery as well. This brings us up to date on where we are at this point so we still have a lot of leads to follow plus stacks of odd bits of information to piece together and puzzle out. However, I think you can see, when researching a series that was all but lost, there is a lot of digging to do and many paths to travel. In this instance, we’re traveling in very good company so that makes the journey, and the work, a distinct pleasure. Stay tuned to Radio Recall. As we unearth more information about the show, we’ll offer periodic updates. We’ll also be sure to announce when the clean encodes are ready for release.